As you’ve probably heard, in the wake of Hurricane Harvey, the city of Houston has been met with severe flooding, leaving many in the city without access to their homes, food, water, and basic necessities. Because of this tragedy, Marrins Moving has teamed up with Duke University to help deliver items to those in need in the area. We believe in doing everything we can to make a difference. We’ve established a donation drop-off at Duke University that’s easy to find and provides a bonus to everyone donating there. The bonus is that with every three items donated, fans are given the opportunity to buy a general admission ticket to the September 9 game vs Northwestern for only $5 — an offer only open to those donating. 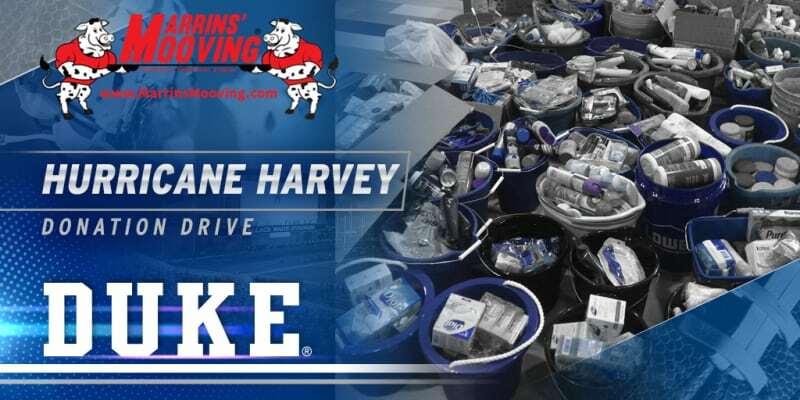 This is a tragedy that deeply saddens both Duke University and us at Marrins Moving, and we both want to do our part to help those affected by the hurricane and flooding. This flooding has led to thousands of people who have been stripped of everything. By donating to the victims of this disaster, you can help them get back on their feet and begin to move forward. “It is important for our team at Marrins Moving to have a direct impact on the way we can assist the victims of Hurricane Harvey. We feel our best way to support is using the resources we have to partner with other triangle families and business that need logistics for supplies. Let’s join together and be the difference! We must make it count.” expresses Josh Oliver, President of Marrins Moving. Donation collection started on August 30, and is open to the public. Saturday, September 2: 9:00 a.m. – 6:00 p.m.
Saturday, September 9: 9:00 a.m. – 12:00 p.m.
*Note – The ticket office will be closed on Monday, September 4th for Labor Day. Every single donation goes to help someone in need in the Houston area. Marrins Moving thanks you in advance for your generosity.